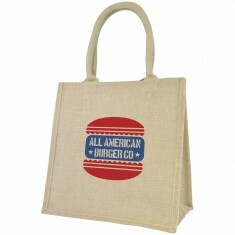 Our personalised Jute Bags are incredibly durable making them excellent for extended brand exposure. 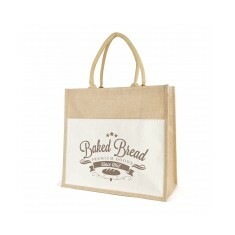 Our range of branded jute bags are excellent for grocery shopping or taking your belonging to the beach to the day. 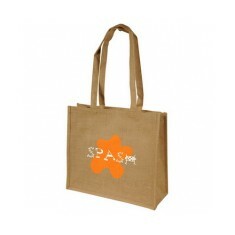 We ensure that our selection are all high quality meaning they suitable for use as promotional gift bags as well. You can be sure this product offers one of the most cost effective ways of ensuring your company is remembered time and time again. 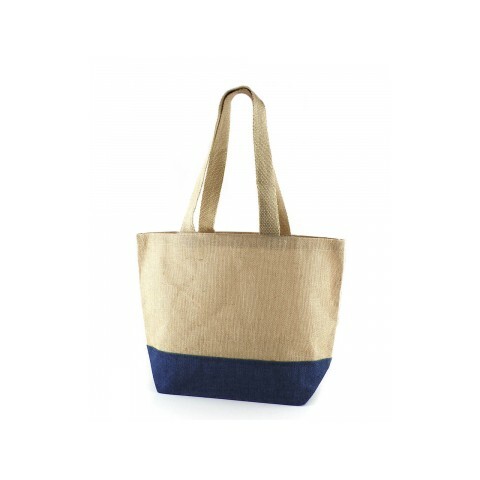 Customised jute bags are made from a strong and thick material that mean they are extremely durable so you’ll never have to deal with a split bag again for when you need an eco friendly reusable bag. 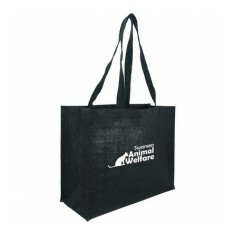 Perhaps you need a splash of colour to these durable bags in which case our custom printed Tembo CT Jute Bag is available with 6 different trim colours to compliment your branding. 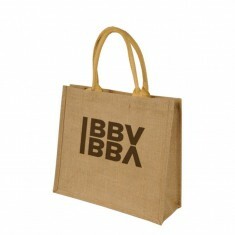 Or maybe you need a retail quality finish, our personalised Cotton Pocket Jute Bag has a premium 10oz cotton pocket on the front for storing any extra bits and bobs you may pick up whilst you’re out. 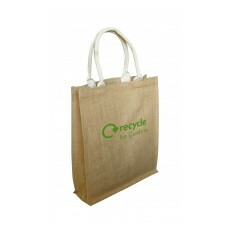 Jute bags are an excellent alternative to plastic bags as they are made from vegetable fibre and whilst they may lack in the soft cotton finish, they make up for it with being extremely durable, meaning your branding will last the test of time. 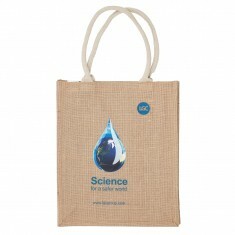 Ideal for a supermarket alternative to plastic carrier bags, they also help to promote an eco-conscious message to any of your clients that receive one. 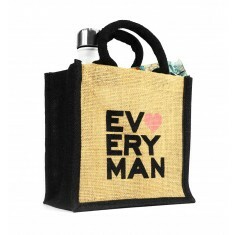 Add your favourite one to your basket so you can get an idea of how much it will cost for you to get a bag that is ready to tackle any challenge head on. 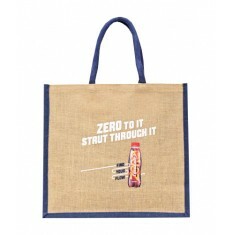 Laminated jute material, cotton webbed handles. 4 base colours. Up to 4 spot colour print. 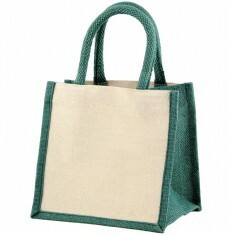 Be kind to the environment, and avoid those 5p carrier bag charges, with our c..
Natural jute material & handles. UK stocked. Large branding area & spot printed. 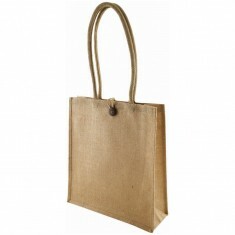 Natural jute material. Cotton webbing over rope handles. 6 colour combinations. 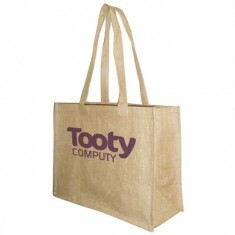 Laminated jute. Coloured gussets. 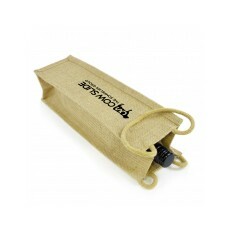 Short cotton cord handles. Printed in spot colours. 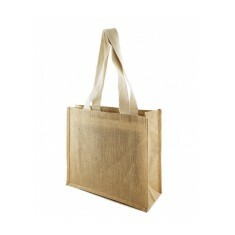 Natural laminated jute. 4 trim colour choices. Large personalised area. 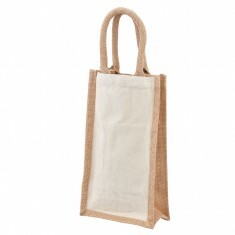 The mini natural jute bag with gusset, rope handle and jute trim and laminated..
10oz cotton pocket at front. 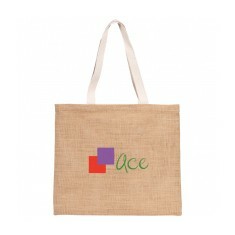 Laminated natural jute. UK stocked. Strong gusset. 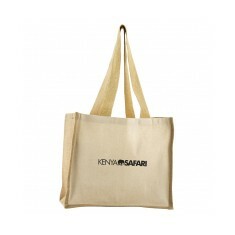 Show off your branding on a premium quality bag, with our customised Kindi Can.. 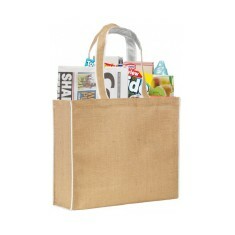 Sustainable Jute Material, Soft shoulder handles. 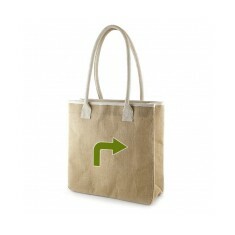 Reusable and perfect for shopping. Large branding area. 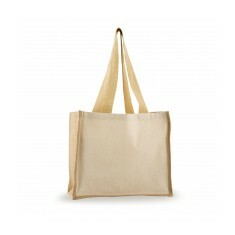 Budget environmentally friendly tote bag made from natural jute with L.D.P.E b.. 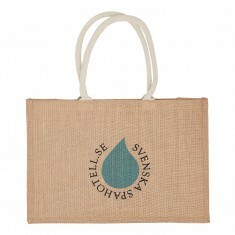 Sustainable jute material. Degradable plastic lining. 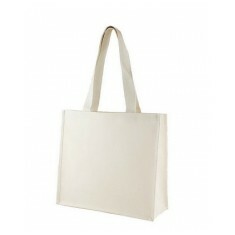 Deluxe cotton webbing handles. 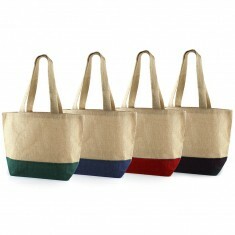 Available in 6 different colours, our customer printed Tembo FC Jute Bag is th.. 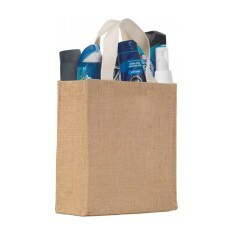 Carry wine and beer bottles with ease using our custom pri.. Extra large capacity. Flat cotton webbed handles. Coloured with AZO free dyes. 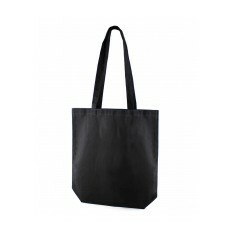 Be prepared when hitting the high street with our Northam ..
Avoid those 5p carrier bag charges, and do your bit for th..
Cotton webbed rope handles. Wipeable plastic interior. 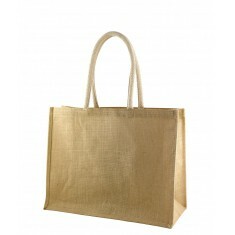 Jute material. 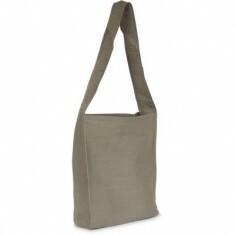 Twin bottle holder made using 10oz canvas and sustainable ..
Short cotton handles. 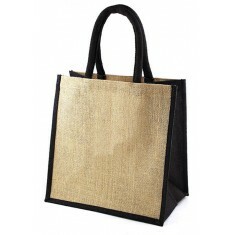 Made from natural laminated jute. 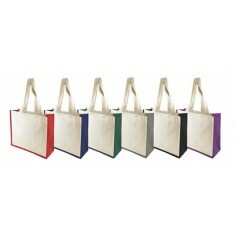 6 trim colour choices. 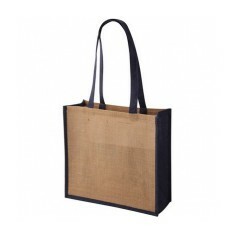 Medium sized natural jute bag with gusset, rope handles an..
Get your branding noticed on the high street with our cust..
Natural laminated Jute with medium cotton cord handles. 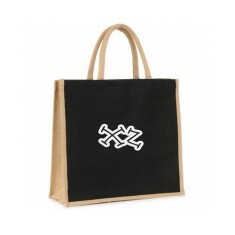 Carry your shopping in style with our personalised Savanna..
Long cotton cord handles. 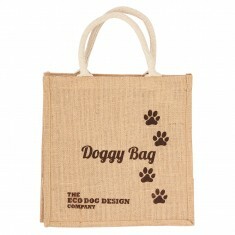 Made of natural jute. 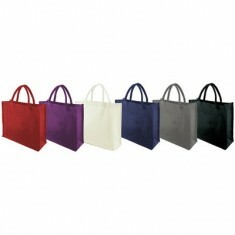 Brand in up to 4 spot colours. 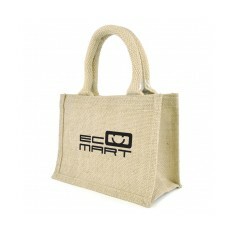 Large, environmentally friendly, eco tote bag made from natural Jute. L.D.P.E ..
10oz canvas. 2 Internal bottle holders. 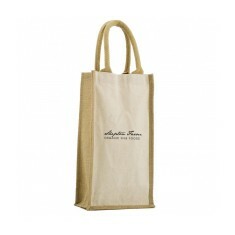 Jute & cotton blend. Large personalised area. 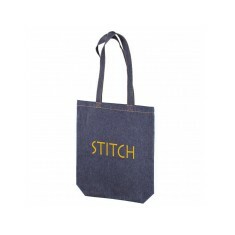 10oz cotton canvas. Jute gusset. Durable material. Two internal wine holders. UK stocked. 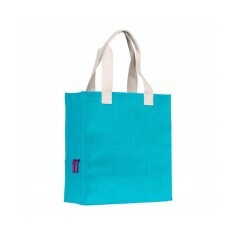 For a Jute bag vibrant enough to brighten any day, our personalised Carnaby Ju..
Grey jute/cotton mix bag with shoulder strap. 10oz canvas. 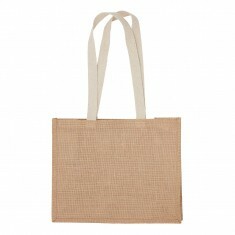 Natural jute material. Laminated gussets. Short handles. 12oz denim. Side & bottom gusset. Long denim handles. UK stocked. 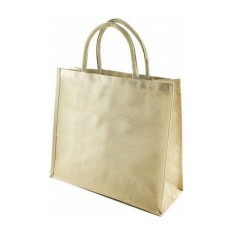 Natural laminated Jutton bag with short cotton cord handles.